Reading the news these days can give you whiplash. The Greeks got [another] bail out: Stocks are up! The Greeks all of a sudden take an interest in their sovereignty: Stocks are down! No, wait, the Greeks were kidding: Stocks are up again! The Tea Party and the Occupy Wall Streeters, polar opposites on the political spectrum, find common ground in the belief that too much power is concentrated with too few people. Governor Romney is a consistent GOP frontrunner, but with little to no passionate support behind him. The President, who has the received the most money from Wall Street donors in history, repeatedly vilifies them. These are strange, paradoxical times to be sure. In keeping, NYU law professor Richard Epstein says that income inequality is...actually a positive indicator? See below for more news from Paradox City. How can it get any crazier? How can it get any more paradoxical? Are we living in some sort of dream akin to the film "Brazil"? Not one week ago, the Europeans "fixed" their sovereign debt problem. In response, markets around the world boomed. All clear, the danger is over, take us down to Defcon 1. Whew, we dodged another bullet...for maybe a day? Just days later, we imploded again. The Greeks may have figured out that forced austerity in the Eurocracy might be no better than a return to Greek Democracy. Pain and suffering with the French and Germans in charge may not be as good as pain and suffering with the Greeks in charge. A referendum has been called that may not just decide Greece's future, but also the future of the European Union, the Euro and, unfortunately, the global economy. No wait, Germany and France gave Greece's Prime Minister a scolding, now we're back to better, right? Should Europe fall into a great recession (are they not already in one? ), then the entire world is likely to follow. There really isn't anything we - that's you and me - can do. We have no pull, no magic wand to wave. We're just here, stuck in an economic soap opera that the Economists of Oz are controlling...or not. All we can do is get up each morning and do whatever it is we need to do to keep moving forward on our own paths. If anything, these are the times to make hay while the sun is still shining. And if that sun does disappear behind dark clouds for a long bout of economic winter, do not fear, for we all are in this together. If prosperity collapses, it will collapse for all, providing no need for fear or envy. Maybe such an event will finally shift our American spirit from entitlement back to empowerment, for there is nothing more empowering than the need to eat. As the flow of money goes, so goes the flow of employment. Employment follows capital, as it is capital that pays wages. With the future of European banks totally uncertain, it is highly likely they will reduce lending activities, which could cause an overall contraction in the supply and velocity of capital. Any contraction in monetary supply and/or velocity will lead to contraction in employment. We can certainly expect staffing reductions at European banks, and, quite likely, hiring freezes all across Wall Street. These institutions are all attached at the hips. As one goes, so go all. The wonderful interconnected financial markets that have greased our global economic wheels are also quite interdependent. The more complex any system gets, the more systemic risk there is. Wall Street employment could be in hibernation for a while. The firms most likely to do any hiring are those boutique and independent securities firms hoping to feed off the remains of any Wall Street demise. The savvier of these firms are positioning themselves to become the leaders should any legacy Wall Street players fall. Additionally, given MF Global's recent bankruptcy, even stronger regulatory oversight might be on the way for the too big to fail. Odds seem good that a break up of those too big to fail will come sooner than later. When it does, there will likely be a rash of hiring as lenders find themselves severely understaffed to manage real credit analysis, underwriting and portfolio management. Having to live with credit decisions surely is going to require more people doing credit and portfolio work. What happens to the sell side might be the most interesting question. Will Merrill resurrect from the ashes of Bank of America? That would certainly be positive for employment there. Can Jamie Dimon at JPMorgan keep the regulators at bay? Should any more financial fish die of sovereign debt food poisoning, Dimon could find himself abandoned at sea. Any return to a Glass-Steagall world will be good for hiring. The buy side is likely to see some paradoxical hiring behavior. The largest institutional investors tied to Wall Street could feel some turmoil should traditional securities markets slide. But well positioned private equity and hedge funds can capitalize on any market weakness to add assets on the cheap. In the corporate world, companies with limited leverage will be well positioned to outlast those too bogged down with debt to remain afloat. The test of any business is not how it performs when the tide is rising, but how it fares after the tide has crested. Look for hiring at the ships whose captains are navigating conservatively. Prosperity tends to exaggerate our pride and confidence, and economic turmoil tends to exaggerate our fear of failure. But history has shown again and again that no one is going to take the word "cycle" out of the dictionary any time soon. There is no perpetual success but for a tremendously lucky few. According to the wealth gap debate today, many believe the top 1% are the tremendously lucky few. But perhaps the really truly tremendously lucky, who manage an entire life without setbacks or hardship, are really just the top .01%. Most of us are working stiffs and will be working stiffs until the day we die, especially given our macroeconomic circumstances. So the path to happiness really lies in our attitude, a balanced approach to all good fortune, and lesser fortune as well. At the end of the day, our happiness is really much more important than our economic success...Right? If not, then how calloused have we become? If happiness is what we really prefer, it can only be achieved by banishing both fear and pride from our hearts and minds. I recently read a theory about happiness that goes something like this: Expectations are the most important input to happiness. The lower your expectations, the easier it is to achieve happiness. Of course we all want more and more and more and more and more and more and more and more and more and more...But hasn't all that more now made you irritated? We hear about our America's high 50% divorce rate all the time, which contributes to a high number of single-parent households. 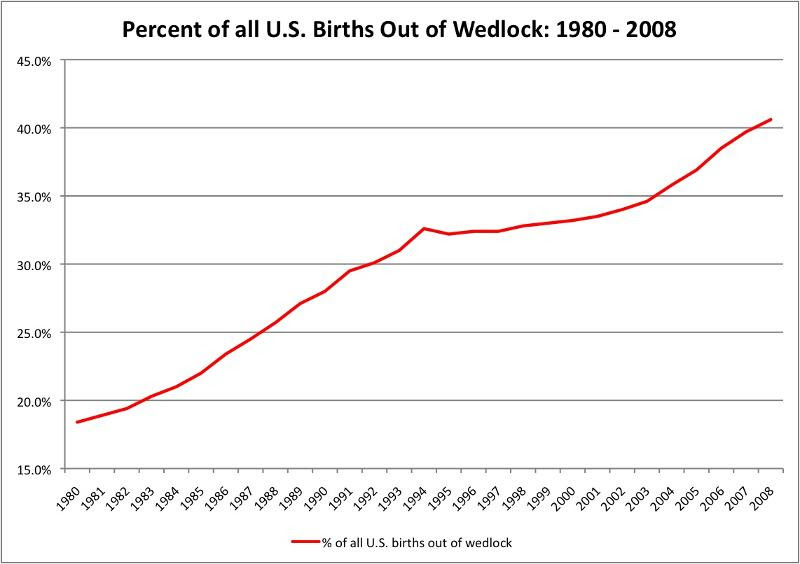 But how many American children are born out of wedlock? We were stunned to see the percentage of all births that occur outside of marriage. If this trend continues, what might this mean for the future of our society? China's third-quarter GDP was 9.1%, the United States' was 2.5%. Their currency is strong, ours is weak. They're building a middle class, we're losing a middle class. China has the economy we all wish we could, right? Not according to a new survey showing that 60% of China's high-net-worth individuals were considering emigrating, or had already made plans to do so. As the world seeks economic hope in China, many Chinese nationals - feeling jittery about China's under-developed social and educational infrastructure and the unrest it could eventually cause - appear be finding hope for long-term personal viability in the U.S. and other countries. Ten new cities are being built in China every year. Dateline Australia investigates what are becoming referred to as China's "ghost cities" - urban centers, replete with commercial buildings, hotels, and apartment buildings, but sit practically empty with near-negligible inhabitants. Meanwhile, millions of residents in preexisting Chinese cities cannot find affordable housing. As the Chinese government builds entire metropolises and their economy soars, might they be artificially driving up real estate costs and building the biggest real estate bubble in history? Furthermore, how does one count the construction of ghost cities in GDP? The dismal new science of stagnationism: Is the future behind schedule? Governments across the globe are pumping billions into economies hoping to tide us over until some sort of organic growth mechanism can reignite ailing economies. While new technologies abound, paradoxically we lack an obvious clue as to which innovation might propel us back to prosperity. Could we actually be living in a period of innovation stagnation? And if so, why? Theories include, among others, that today's investors are far more impatient than in the past, and that investors might be backing the wrong ideas. With persistently bad economic numbers, it's easy to speculate that America really is in decline. In absolute terms, America has very real problems. But in relative terms, Joseph S. Nye, Harvard professor and former U.S. Assistant Secretary of Defense, argues that America will remain the world's relative superpower, even as other countries, namely China, grow their global influence. Read on for an optimistic take on America's pessimistic economic and political environment. Texas: The most green state in America? The employment pool hasn't been this large since the Great Depression. Yet more and more employers complain that they can't find the right people to hire, often blaming deficient education. But might companies be at some fault? One theory is that the record high unemployment rate has led to unreasonably high expectations for prospective employees - a Catch-22 that could be exacerbating our employment situation. The author attempts to identify the real issues and suggests solutions to expand cost-effective training initiatives for new hires. A series of mentors and years of feedback and constructive criticism help propel people to and prepare them for senior leadership roles. But once in these roles, feedback and coaching tend to recede considerably even though their need and value do not. This article suggest ways to preclude scenarios where senior leaders become progressively isolated and out of touch with perceptions of their performance, like using teams of junior staff to function as evaluators. Daniel Goleman, author and expert on emotional intelligence, says understanding that the brain operates in three different states - disengagement, frazzle and flow - provides an opportunity for leaders. The best leaders will develop a strategy that helps keep their employees in the flow state, where the brain is most engaged and people are most productive. Among other tactics, Goleman suggests making work meaningful to people, and creating an environment where people feel comfortable working uninterrupted by emails and calls for a stretch of time so that creativity can be fostered. The CEO of a global staffing firm and a Nobel laureate economist offer two different perspectives on the unique employment challenges created by global economic interconnectedness and recession. The nature of how we work is changing as entire categories of work have been wiped out. Watch these compelling interviews for possible solutions and ideas to adapt. A new study shows that happy employees stay in the office twice as long as their unhappy colleagues, spend double their time focused on their assignments, take fewer sick days, and believe they are achieving their potential. The authors of this research cite five happiness drivers: contribution, conviction, culture, commitment and confidence. Follow the link to read more about how to use these five drivers to cultivate happy and more productive employees.